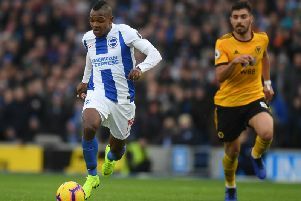 Brighton & Hove Albion manager Chris Hughton has said that it has been a 'tough week' in reacting to Liverpool defeat, also assessed striker Jurgen Locadia's performance and reacted to the Premier League season. An off-colour Seagulls fell victim to a rampant attacking display at Anfield on the final day of the Premier League season. Goals from Mo Salah, Dejan Lovren, Dominic Solanke and Andy Robertson saw the Reds cruise to a more-than comfortable 4-0 home success. With that, they sealed a top-four place and with it, Champions League football next season, no matter what the outcome of the final with Real Madrid is in Kiev in 13 days time. It was stark contrast for the Seagulls, who secured Premier League safety after promotion with a historic success over Manchester United with two games to spare, exceeding virtually everyone's expectations at the start of the campaign. After losing 3-1 at Manchester City on Wednesday night and then playing Liverpool away today, Hughton felt both games had taken their toll on his players. He said: "It's been a tough week for us and I think that probably showed a little bit. We flew up to City during the week for a very difficult game up there where the concentration levels have to be high. To come and do it again a few days later, I think maybe it took it's toll a little bit. "When you look at the forward line they started, we knew we were going to be in for a difficult afternoon. You have to defend really well, be a bit fortunate, which a times we were, have a good goalkeeper that can make good saves, and most of all, we needed to be better on the ball. "We never relieved the pressure enough with our ability on the ball. It was difficult, very difficult. "They are a side that can do that. If you look at the two most difficult away games at the moment, due to the way they play, are Manchester City and Liverpool. To play them in three or four days of each other are very difficult. "They showed the quality they have got. These are a team that we are all hoping will win the Champions League in a couple of weeks - that's the level, we fell short of that level today." Locadia made his third start of the season, but was taken off for Glenn Murray early in the second half having had a minimal impact. Hughton said: "It was a good opportunity for him in a difficult game. He is one that has settled in really well. His time will be next season, we will have a real good pre-season with him. "With the type of runs he makes we thought we might benefit from it and with Beram Kayal, who is dynamic in that midfield, we thought we could capitalise on it. "On a day like today, the team selection I don't think it's a question. Whatever team we would have put out today, it would have been a difficult afternoon. "When you speak with him (Jurgen),it's the intensity of the Premier League. He has come from a division that is very technical. Here, he won't get the space and time he did in Holland. He's trained really well and we look forward to a full pre-season with him." On their 15th-placed finish in the league, Hughton added: "We would have taken it. There are contrasting emotions, though it's not been a good week for us. You come here and for anybody in our team that had not been here before, the experience of the quality they have got, the stadium and atmnosphere is a great one for our players. "They have showed they want that again, they have showed that all season of how desperate they are of that. What they will be thinking is hopefully we can come here next season and make a better account of ourselves."